Agilent Technologies has introduced three test instruments that offer new levels of functionality and value. One instrument is a next-generation hybrid that combines a digital multimeter (DMM) and a power supply in one unit. The other two introductions, a pair of DMMs, provide basic capabilities and solid performance at affordable prices. The Agilent U3606A multimeter/DC power supply is a convenient hybrid that combines a 51/2-digit DMM and a 30W dual-range power supply. Unlike most "source-and-measure" devices, the DMM and power supply can operate simultaneously and independently, providing efficient, affordable testing and saving space on the bench or in a rack. The DMM includes essential multimeter capabilities as well as four-wire milliohm measurements and eight math functions. The power supply adds overvoltage and overcurrent protection plus additional output capabilities such as auto scan and ramp, and a square-wave generator. The DMMs are the Agilent U3401A and U3402A, which provide 41/2- and 51/2-digit resolution, respectively. Designed for educational, electronics and communications applications, these elegantly simple models also include up to six built-in math functions and a lock slot for physical security. "With two fully independent devices in one unit, the U3606A hybrid establishes a new category of space-saving instrumentation," said Ee Huei Sin, vice president and general manager of Agilent's Basic Instruments Division. "Collectively, these additions to our low-cost line bring greater convenience and affordable, just-right capability to virtually any bench or test system." 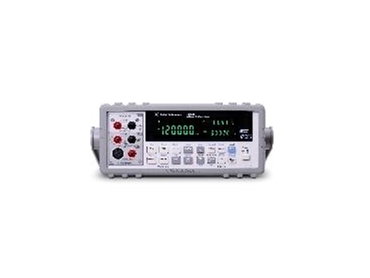 The Agilent U3606A multimeter/DC power supply is available now. Both the Agilent U3401A and U3402A DMMs are also available now.